 Players have to manage their time and resources to ensure pollution doesn’t go too high.  Once it does, the world around them starts changing.  Adding achievement and badge systems. Simple rules: (1) You enter an unbalanced, not pristine, world. At the start, you need to make choices that impact the environment. (2) Are you mining for coal and using a furnace to produce energy and prepare products, such as processing iron ore for iron? (3) Or do you collect trash/recyclables to reharvest some rare metals to be able to produce a wind- or watermill? (4) Trees take time to grow. (5) They deteriorate and ultimately die when the air, soil, or water pollution is high. You are spawning in the game at random location and in random environmental conditions. Players start with an unbalanced world–random levels of pollution (left), levels reset and randomize when player dies and re-spawns (right). Pollution is cause by using pollution-producing machines like water turbines or furnaces (left). However it can be lowered by planting trees and using water filters. Pollution can be negative, meaning the player has some room to use the machines and keep the world healthy (right). Properties of various game objects. A furnace will smelt iron and gold fast, but it also pollutes the air more quickly. An electric furnace will cost a lot more to build, and the player will have to recharge its batteries, but it will pollute the air a lot more slowly (left top). To counter the pollution, players will have to plant a lot of trees. Trees take time to grow. 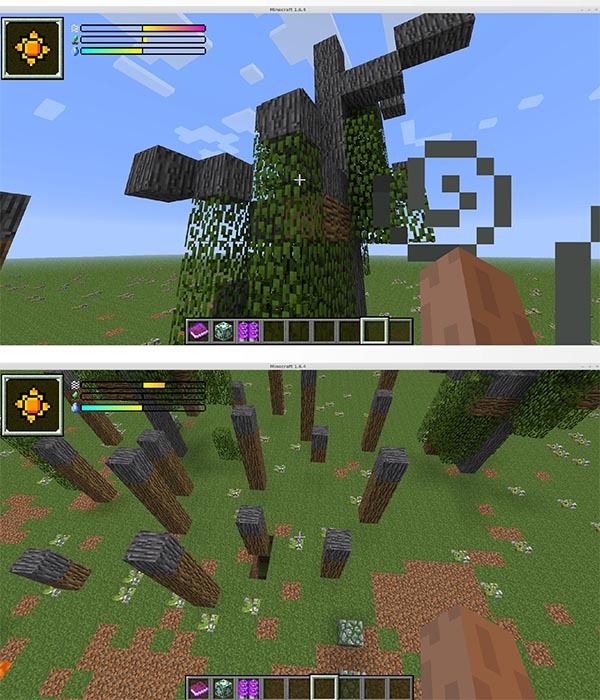 Players have to plant saplings, which will slowly turn into trees over time (left middle and bottom). Soil pollution is the only type of pollution that goes down in quantity by itself. It takes a long time, but it will eventually go down if the player doesn’t pollute the air or water. Air pollution and water pollution directly increase the soil pollution. Therefore, it is extremely important to keep both in check. Players need to be prepared for unexpected events and disasters that can impact the gameplay. In the case of the Sustain Mod, disasters happen every couple of minutes and trigger negative changes in one of the pollution types. If a player is unprepared for these events (operating just below the maximum pollution levels), this may cause the death of a player. 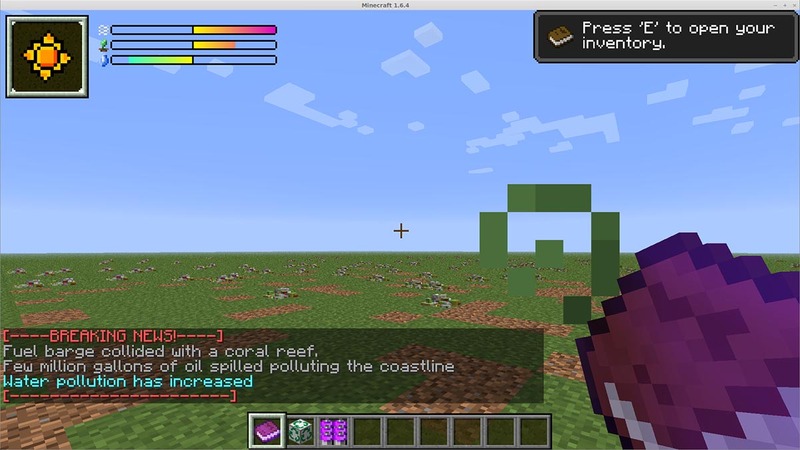 Trash Block (above left)– Randomly generated around the world. Player puts them into a Recycler and gets random materials. Recycler (above center) – Turns trash into random resources. Needs batteries to run. Can’t be crated. Player gets one when they spawn. Battery (above right)– Item that stores power generated by wind and water turbines. Unexpected events can significantly alter the gameplay and score tally. The only type of pollution that affects the player directly is air. At around 80%, the character gains Weakness status. This will slow down mining and attacks will deal less damage. At around 100%, the character gains Poison status. 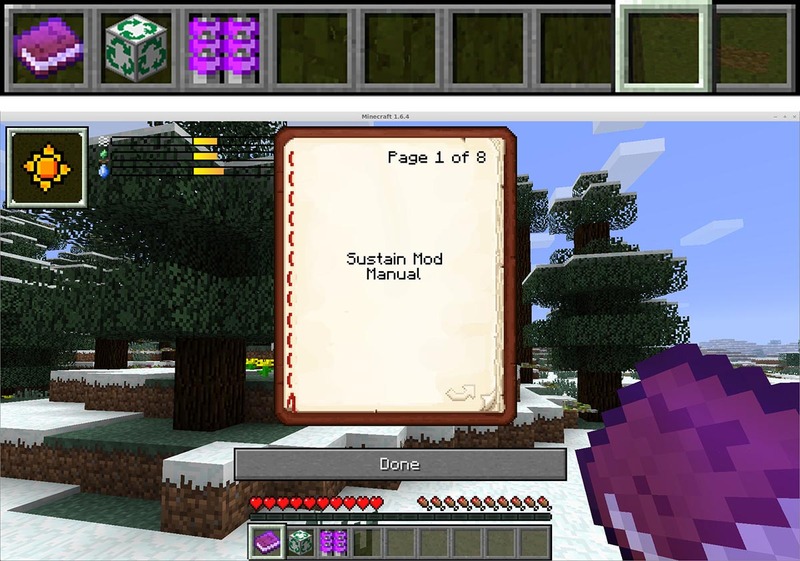 This will slowly drain health until the player dies and respawns again. Balancing player strength versus amount of pollution. The higher the amount of air, soil and water pollution, the faster the world is changing/decaying. Wind Turbine – Produces power. Expensive to build. Does not pollute (top panel). Water Turbine – Produces power. Needs to be placed in water. Cheaper than wind (second panel from the top). Electric Furnace – Smelts metals twice as fast as regular stone furnace. Needs batteries to run (second panel from the bottom). Water Filter – Filters water and decreases water pollution. Needs to be placed in water. Needs batteries to run (bottom panel). Machines will have a certain lifespan. They will have to be repaired. If they start breaking, they will produce/work slower. When they are not repaired they will simply be destroyed – New tools, such as Wrench – Repairs machines and gets damaged over time. (1) Kids in elementary and middle schools. The Sustain Mod is meant to teach children about the environmental problems and choices we make everyday. (2) Minecraft players who wish to extend the game and try new challenges.